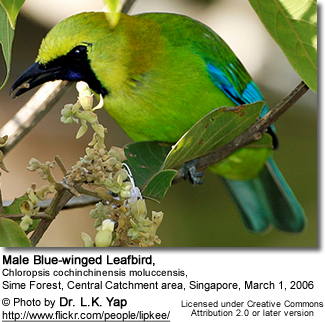 The Leafbirds (Chloropseidae) are small, colorful songbirds that are found in India and Southeast Asia. Leafbirds were named for the fact that their mostly green and yellow plumages blend in well into their tropical habitat, where the green leaves and bright flowers of the canopy provide a perfect camouflage for these birds. However, leafbirds that are stressed will shed most of their colorful feathers. This adaptation may have evolved as a way of confusing predators, such as snakes. Captured birds under stress will do the same. 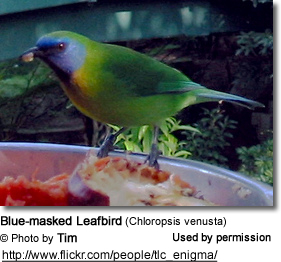 This genus consists of 11 species and 27 subspecies, one of which - namely the Blue-masked Leafbird - is threatened by habitat destruction and capturing for the pet trade and another one - the Philippine Leafbird - is listed as vulnerable for the same reasons. The other species are still common in suitable habitat, which is - however - decreasing due to ongoing deforestation. 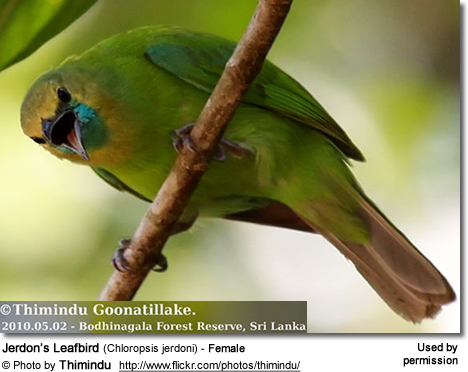 Leafbirds occur over a wide range in south and southeastern Asia, specifically the Greater Sunda Islands and India. 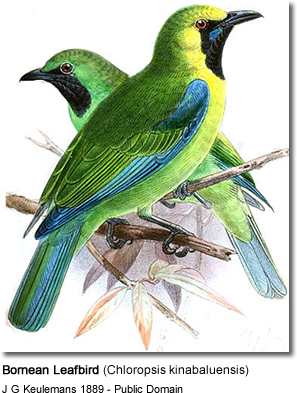 The Greater Green Leafbird is endemic to Sumatra and two - the Yellow-throated Leafbird and the Philippine Leafbird occur naturally in the Philippines. The Bornean Leafbirds are restricted to northern Borneo, as is suggested by their common name. They occupy broadleaf forests - lowland rainforest to monsoon and montane forests, some extending to secondary growth and orchards. The Golden-fronted Leafbirds and Jerdon's Leafbirds occur in deciduous monsoon forests. The Orange-bellied Leafbirds rarely descend below 3,300 feet (~1000 m). Leafbirds usually remain high up in the canopy of trees searching for insects to feed on. The medium-sized leafbirds range in length from 5.5–8.3 inches (14–21 cm) - including their short tails, and weigh between 0.53–1.7 oz (15–48 g). They have forked, brush-tipped tongues and fairly hefty, straight to lightly down-curved bills with stiff, hair-like feathers at the base that protect their eyes from the legs and wings of their insect prey. Their plumages are varying combinations of green, yellow and orange; and, occasionally, a little red and blue markings on the wings and tails. Most have dark faces and bibs. The males and females can easily be differentiated in most species, as the females are typically less colorful, particularly around the head and either lack the face mask or it is less extensive. 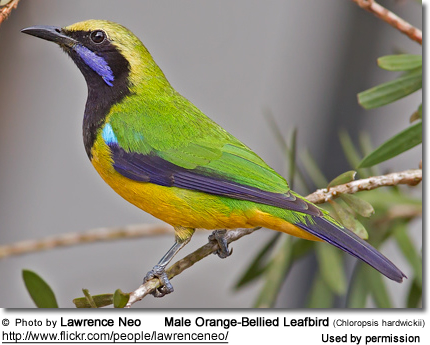 The exception to this is the Philippine Leafbird, where males and females look alike. Immature birds look like duller versions of the females. 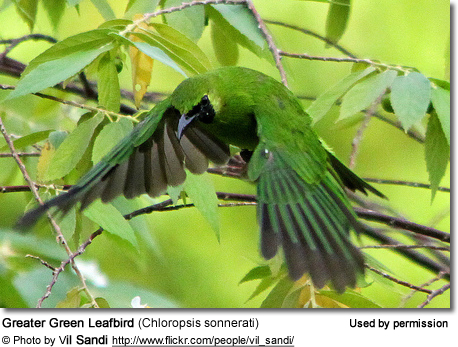 Leafbirds resemble bulbuls, but can be identified by their brighter plumages. Chinese: ??? ?, ??? ?, ???? ... Czech: sýkavka modrok?ídlá, Sýkavka žlutohlavá ... Danish: Blåvinget Bladfug, Tamilbladfugl ... Dutch: Blauwvleugelbladvogel, Blauwvleugel-bladvogel ... Finnish: Sinisiipilehvi ... French: Verdin de Jerdon, Verdin à tête jaune, Verdin de Bornée, Verdin de Bornéo, Verdin des Kinabalu ... German: Blauflügel-Blattvoge, Jerdonblattvogel, Kinabalublattvogel ... Indonesian: Burung daun sayap biru, Cicadaun Sayap-biru, Cicadaun Kalimantan ... Italian: Fogliarolo aliazzurre, Verdino aliazzurre ... Japanese: akabanekonohadori, aobanekonohadori, ????????? ... Malay: Burung Daun Sayap Biru ... Norwegian: Blåvingebladfugl ... Polish: zielenik blekitnoskrzydly, zielenik b? ?kitnoskrzyd?y, zielenik dekanski, zielenik deka?ski ... Russian: ?????????? ???????? ... Slovak: zelenácik modrokrídly, zelenácik bornejský ... Slovak: zelenácik indický ... Spanish: Verdín de Jerdon, Verdín de Alas Azules, Verdín de Borneo ... Swedish: Blåvingad bladfågel ... Thai: ?????????????????????? Leafbirds build open cup-shaped nests out of fine stems, leaf parts and rootlets. These nests are typically placed on the ends of branches near the tree crown; although some may hang from thin horizontal shoots of trees, or they are attached to a pair of vertical twigs. The average clutch consists of 2 - 3 pinkish eggs. The incubation lasts about 14 days and is performed by the female alone, while the male feeds the brooding female. Even though unconfirmed, it appears likely, that the male also helps raise the young. Leafbirds typically forage alone or in pairs in the subcanopy; but some species may occasionally join mixed feeding flocks, while other species defend their feeding territories. They feed on mostly insects, as well as taking fruits, berries and nectar. Insects: Their long sharp beaks are curved down slightly and a brush tipped tongue, helping them to pick insects from the bark and leaves of trees. They will also pursue flushed prey into the air or down to the forest floor. Nectar: Their spiked tongues are well adapted for taking nectar from tubular flowers, such as the Rhabdornis of the Philippines. Like hummingbirds, they will hover in front of a flower while retrieving the nectar. In the process of feeding, the flowers benefit from cross-pollination as the leafbird's head becomes covered with pollen and spreads from flower to flower. As they move to the next flower, the pollen is deposited on the next flower, which is then able to produce seeds and fruit. Many native plants rely on them for pollination and would not be able to exist without the "services" inadvertently rendered by the leafbirds. Fruits: Usually, leafbirds swallow pieces of fruit whole. If this isn't possible, they will pierce the fruits with their beaks and let the juices leak into their mouths. Their attractive songs include various melodious whistles and chatters. In addition to being colorful, several leafbird species are also good mimics making them popular cage birds.